"Never ever threaten the United States again or it will suffer consequences as few in history have suffered before", Donald Trump said on Twitter in a clear warning to his Iranian counterpart Hasan Ruhani, who has challenged the United States by saying: "The United States must understand well that peace with Iran is the mother of all peace, and that the war with Iran is the mother of all wars". Although the crossing of words between both leaders threatens world peace, the Persians rule out the possibility of a military confrontation that could unleash a global conflagration with disastrous consequences due to the current development of nuclear weapons. Iran has once again shown its discontent and disenchantment with US measures that seek to undermine its political and social regime. The sanctions made by Washington continue to lacerate the economy of the Asian country that tries to avoid the economic siege with allies such as Russia, China and Venezuela. Trump's strong rhetoric is reminiscent of the strong words that the North American leader exchanged with the North Korean leader Kim Jon-un, with whom he already made peace and reached an agreement to denuclearize North Korea. Many political analysts and experts on issues of the Middle East believe that is contrasting. Iran has won the hatred of the United States, even though it decided to collaborate and sign a nuclear agreement with the world powers while North Korea, which openly presumed to manufacture nuclear weapons, deserved the shake hands. Although Iran signed an agreement, the United States has not wanted to reach a diplomatic arrangement with the Middle Eastern country and far from a rapprochement, favors distance. It is evident that Trump does not seek a political or diplomatic approach; he rather wants Iran to give in to the pressures of the United States and request an agreement in which the American nation is the main beneficiary. This has been stated to world by Donald Trump, who wrote from his digital throne, Twitter: "They are going to call me and say 'let's make a deal”, a naive and foolish aspiration, since the Iranian regime has resisted the pressure of the United States and the Western powers for years. Why the blindness? Perhaps because subduing Iran is a way to control the oil of that nation and trade in the region because of Iran’s strategic geographical position. Then it is possible to suspect that Washington, as it has done in other nations of the area, intends to subvert the regime change in the Persian country. Already Secretary of State Mike Pompeo told Iranian dissidents that Washington only wants a significant change in Iran's government. In other words, turn it into a satellite country. To this end, the American nation has already reinforced the media war as it has done in other countries and investment in means of ideological combat is increasing. The important thing for the White House is the “soft coup” or coup of "a new kind" to handle Iran's political-economic threads. This was stated in a speech by the Secretary of State who revealed that the Broadcasting Board of Governors (BBG) is taking new steps to help Iranians to overcome censorship on the Internet and launch a new 24-hour channel in Farsi on TV, radio and digital formats and social networks. "The United States listens to you, the United States supports you, the United States is with you", Pompeo encouraged the Iranians of the diaspora, which is a clear evidence of the U.S. aspirations to overthrow Tehran’s regime. Pompeo has also attacked Iranian political, judicial and military leaders accusing them of widespread corruption. The government of Tehran "repressed without mercy the human rights, the dignity and the fundamental freedom of its own people", he snapped in a speech. However, Iran has not stood idle, neither its leaders. 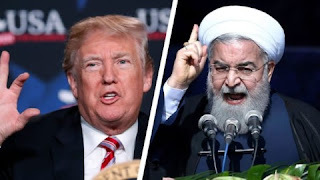 Already Iranian President Rohani warned Washington of the possible closure of the Strait of Hormuz to continue the siege against his country. This is a strategic point in the Persian Gulf, where it’s transported 30% of the oil transported by sea worldwide. However, despite the aspirations of a diplomatic outcome that soften tensions between the two countries, some governments like Israel encourage belligerence between the world's greatest power and its common enemy: Iran. Benjamin Netanyahu, Prime Minister of Israel, praised the "firm stance" of the US president after years in which the "(Iranian) regime was spoiled by the world powers", he told media. The words of the Israeli prime minister point directly to the Western powers involved in the nuclear pact with Iran: Germany, Britain, France, Russia, China and the European Union, which do not agree with Washington to withdraw from the agreement, much less isolate the Persian country. Obviously, Donald Trump's ignorance of foreign policy and his ignorance take its toll over and over again when he makes decisions. Trump ignores the religious faith of the Iranian people who follow Ayatollah Ali Khamenei and make them overcome any difficulty. The Ayatollah is the supreme leader and maximum authority in political and religious terms. Let’s wait if the speeches of both leaders transcend and rise to a critical point as it happened with North Korea, to then reach a truce. However, with Trump in the presidential chair it is very difficult to predict a decision. Like earthquakes, the American president is unpredictable.